By popular demand - Nigella's book of Christmas. For years her fans have been asking when she would write a Christmas book... and here it is, a glorious, glittering festive treat. Nigella Christmas comprises reliable, practical, easy-to-follow recipes and reassuring advice about planning and cooking ahead, presented in a gorgeous glittering package which will make this the ultimate gift to yourself and for family and friends. Illustrated with over 150 fabulous full-colour photographs by Lis Parsons (photographer of the bestselling Nigella Express), including method photos and lavish double-page 'spreads', Nigella Christmas is in a new, larger and irresistible format. It includes everything from scrumptious Christmas cakes and puddings, to quick and easy homemade presents (biscuits, preserves and other standbys) and edible tree-decorations, recipes for feeding friends and family over the holiday season with minimum stress and maximum enjoyment (cook and freeze ahead or slow-cook in the oven), as well as Christmas party food and drinks. 'I love Nigella Lawson's writing and I love her recipes' - Delia Smith 'There's an intelligence to the way she writes and she expects a certain intelligence of her readers as well' - Nigel Slater "I am unapologetic about being a home cook rather than a chef. Real cooking, the sort that goes on in homes, does not have to be tricksy or difficult. A dish of chicken poached with leeks and carrots definitely isn't fancy. But it tastes good, and feels essentially nourishing, to both body and soul, to cook and eat. I want you to feel that I'm there with you, in the kitchen, as you cook. My books are the conversations we might be having." Nigella Lawson has written nine bestselling cookery books, including the classics How To Eat and How to Be A Domestic Goddess - the book that launched a thousand cupcakes. These books, her TV series and her Quick Collection apps, have made her a household name around the world. In 2014 she was voted Best Food Personality at the Observer Food Monthly Awards. Nigella Lawson, food enthusiast, television personality and journalist, is the bestselling author of eight books: Nigella Express: Good Food Fast, Feast: Food to Celebrate Life, Nigella Fresh, Nigella Bites, How to Be a Domestic Goddess, How to Eat, which have sold in excess of 6 million copies worldwide, and Nigella Christmas: Food Family Friends Festivities. Her groundbreaking iPhone App debuted in April 2010 and her book, KITCHEN: Recipes From the Heart of the Home, which accompanies her television series of the same name seen on Food Network, is a return to her signature focus on feel-good food for the way we eat today, published by Hyperion in October 2010. Nigella's 2005 book Feast: Food to Celebrate Life inspired Nigella Feasts, which debuted on Food Network in fall 2006. The Domestic Goddess returned in her second Food Network series, Nigella Express, launched in fall 2007 in conjunction with the release of Nigella Express. American audiences also know Nigella as host of Forever Summer with Nigella, her popular cooking/lifestyle series that aired on Style, and Nigella Bites, which aired on E! Entertainment Television and Style. In July 2003, Nigella launched Nigella Lawson's Living Kitchen, a range of kitchen items designed in collaboration with Sebastian Conran, to widespread acclaim in the U.S.
Nigella was Deputy Literary Editor of The Sunday Times before pursuing a successful freelance career. She has written for a variety of magazines and newspapers, including The Sunday Times, Evening Standard, Guardian, Daily Telegraph, Observer, Times Magazine and in the U.S. for Gourmet and Bon Appetit magazines. She originated the restaurant column in The Spectator and wrote the food column for British Vogue for several years. Nigella also wrote a bi-monthly food column for The New York Times Dining In, Dining Out section. Hailed as Author of the Year by the 2001 British Book Awards, Nigella was also named Bon Appetit magazine's 2002 "Tastemaker of the Year." How to Eat was honoured as the 1998 British Books Awards Illustrated Book of the Year, while How to Be a Domestic Goddess was named Cookery Book of the Year by the Guild of Food Writers in 2001. 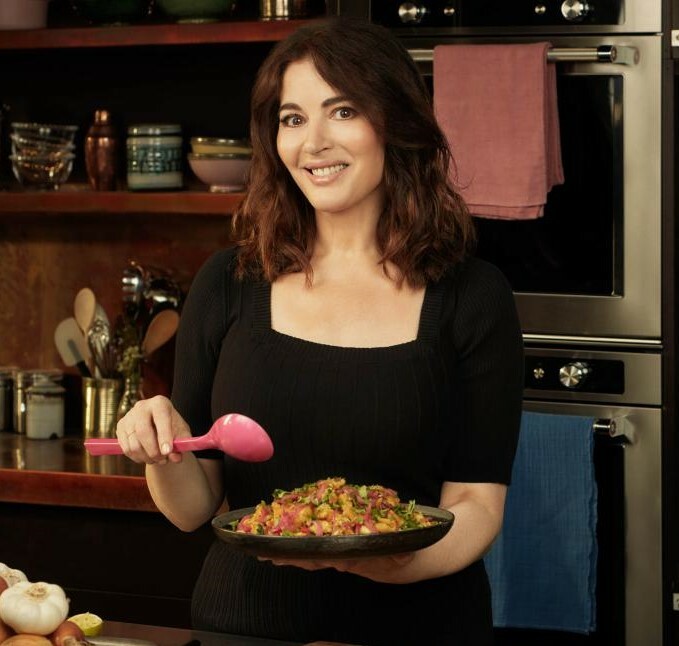 Nigella Bites received the WH Smith Book Awards 2002 Lifestyle Book of the Year, with the cooking series based on the book winning the Gold Ladle for Best Television Food Show from the World Food Media Awards in 2001. In 1992, Nigella married the journalist and broadcaster John Diamond. John was diagnosed with throat cancer in 1997 and died in 2001. They had two children together, Cosima and Bruno. Nigella remarried in 2003 and lives in London with husband, Charles Saatchi, and her children.